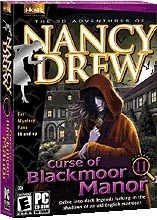 Nancy Drew games Nancy Drew Curse Of Blackmoor Manor. I really love Curse Of Blackmoor Manor. It was the second Nancy Drew Game I bought. I like it a lot. What do you think of it?